CORPUS CHRISTI - Lee Yeager of Veterans Memorial and Bishop's Mike Medina will be honored at the 15th Annual South Texas Winter Baseball Banquet, scheduled for Thursday, January 24 at the Omni Corpus Christi Hotel. Yeager, who guided Veterans Memorial to the Class 5A state tournament last season, picks up his third Large School Division Coach of the Year award. The Eagles finished 2018 with a 33-7-1 record, advancing to Round Rock in the school's third year of varsity play. Veterans Memorial slotted second in the south zone of District 30-5A, compiling a 6-2 mark. The Eagles won eight of nine playoff games, including a regional-final sweep of Kerrville Tivy. Their campaign came to an end with a 3-1 loss to Forney in the state semi-final. Junior pitcher JoJo Villarreal earned first-team all-state honors by the Texas High School Baseball Coaches Association. Freshman Daylan Pena and senior Jesus Rodriguez were all-state second-teamers at first base and third base, respectively. The Corpus Christi Caller-Times tabbed Rodriguez its All-South Most Valuable Player. Pena was the All-South Texas Newcomer of the Year. Villarreal and senior outfielder Jeffrey Boggess were also on the All-South Texas first team. Yeager was recognized in 2012 after leading the Carroll Tigers to their third straight tournament appearance. He was the first Large School Coach of the Year to be honored at the South Texas Winter Baseball Banquet after the Tigers won the school's first 5A state title in 2010. 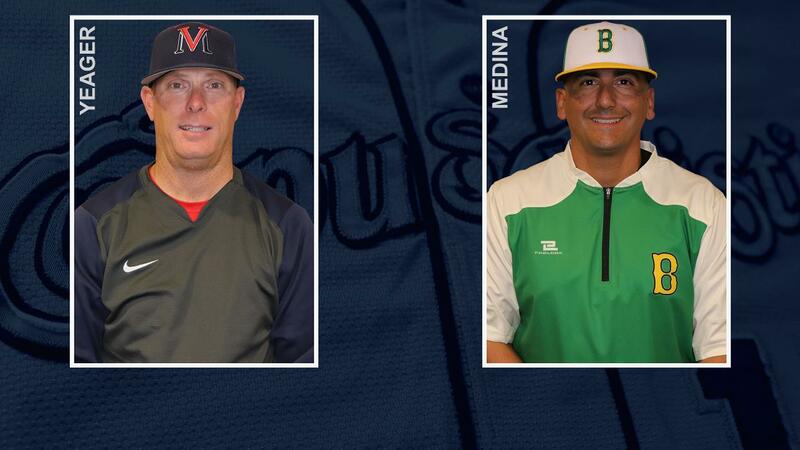 Medina, the District 31-3A Coach of the Year, advanced Bishop to the Region IV-3A finals last season. The Badgers boasted a 26-8-1 record, including a 7-1 mark during district play which earned them the 31-3A title. Bishop's bid for a state tournament appearance fell short after dropping a three-game series against Gateway Prep. Medina's Badgers began the postseason with seven consecutive triumphs, including two-game sweeps of IDEA Quest College Prep, Goliad, and Hallettsville. Sophomore pitcher Kobe Jaramillo was first-team all-state by THSBCA and the 31-3A Pitcher of the Year. Senior Jon Fernandez was the district's offensive player of the year. Junior pitcher Nicolas Hernandez, senior first baseman Matthew Colecio, and senior outfielders Geno Huizar, and Ram Carrillo were 31-3A first-teamers. Tickets to the South Texas Winter Baseball Banquet are on sale now at the Whataburger Field Box Office, or via phone at 361-561-HOOK (4665). Special guests include Hall of Fame pitcher Nolan Ryan, Astros President of Business Operations Reid Ryan, Ryan Sanders Baseball Owner and CEO Reese Ryan, and Ryan Sanders Baseball Principal Owner Bret Sanders. Other banquet honorees are lifetime achievement award winner Don Sanders, the Mike Adams South Texas Pro Player of the Year Mike Franco , area collegiate players of the year, 2018 High School Softball Coaches of the Year and 60 student athletes from 26 Coastal Bend high schools.